29 March 2017 was not a good day in the history of the U.K. It was the day when we took a wild leap into the unknown, chasing fantasies over reality. What Brexit actually means is hardly clearer now than when the referendum was called. The prize for the most absurd Brexit comment on the doorstep in the first three months of 2017 goes to the person who said: “I voted Leave. We were fine before we went in and we’ll be fine now. It’s my children and grand-children I feel sorry for”. The litany of lies from the Leave campaign should anger people: the £350 million a week for the NHS (denied the morning after the vote), the fantasy of a threat that Turkey would join the EU and flood us with immigrants (suddenly not an issue), the threatened end to free movement of people causing nurses to leave the country than burst of jobs, “take back control” turning into having to obey the rules others make in what Michael Hessletine has called “the greatest loss of sovereignty in British history“, and renewed pressure for Scots independence and Irish re-unification which brings the Brexit-related break-up of the U.K. much closer. In the background are the recurring stories of how “we won the war on our own”, which are dangerously rooted in fantasy rather than reality and a total failure to recognise how much the world has changed. There are stories of of civil servants calling plans to get closer to the Commonwealth “Empire 2.0”, which accurately reflects the fear that this is about recovering past glories (that don’t merit close inspection). Having been missing in action over Brexit, Labour have finally come forward with six criteria that any Brexit settlement must meet which include the requirement that we have the “exact same benefits” as currently afforded by membership of the single market and the customs union. That’s a shrewd test. They are quoting a promise made by David Davis: he must have known that the only way we can have access to the single market and customs union which is as good as that of members of the EU is by being a member of the EU (the promise is already in tatters and he’s been appropriately roasted). They are not torpedoing the implementation of the referendum as much as they are proving the impossibility of doing this without harming those who voted for Brexit. The article 50 process is a huge grab for power by No.10. The group being ignored as No.10 implements a far-right agenda is the people who voted Leave, and probably were not voting to lose their jobs or see their food bills rise. That’s in stark contrast with LibDem peer William Wallace’s attempts to start a listening process(which is the behaviour of a responsible party of government). In the middle of all this, Andrew Duff has argued for a while that it would be better for the EU if the UK left and instead entered an association agreement. His point is that the UK has been standing in the way of reform in the EU for a long time: we have been preventing it changing while accusing it of refusing to change. He’s right. A good association agreement would (or could) give most of the benefits of membership, without letting the UK wreck things. On the morning of 29 March, David Starkey spoke on the Today programme, drawing a parallel between Brexit and our break with Europe when Henry VIII presided over the break with Rome. The parallel echoes the outbreak of interest in the Tudors and on television in recent years, but that too is pedalling a fantasy. Henry VIII’s break with Rome was a complex process, more to do with his own expediency than deep principle, which makes sense only as part of the Europe-wide process of the Reformation. Now the Europe-wide process is about working together and coming together. Brexit is not a brave “going it alone”: it is an abdication of responsibility for shaping our future. The wild fantasies around Brexit have seen Theresa May, with indecent haste, rush off to see Donald Trump. In the UK, there is less approval for him than any US president in living memory, yet seeking close ties with the US is being seen as the alternative to the EU. Is that what we want? Angela Merkel’s much more measured approach shows what a wise leader’s response to Trump looks like. The media is extraordinary. The BBC’s feeble coverage of the 100,000-strong March for Europe on 25 March was so minimalist that it sounded like bias and even as amended falls short of the coverage in the Frankfurter Allgemeine Zeitung. We’ve seen very distorted language. There are claims that “Europe will punish us for trying to leave”. Farage accused the EU of “declaring ‘war’ on Britain”. Boris Johnson spoke of the French President Hollande of wanting “to administer punishment beatings to anybody who seeks to escape [the EU], in the manner of some world war two movie”. When Joseph Muscat, Prime Minister of Malta said that the UK couldn’t get a better deal outside the EU than it has now his words were initially mis-spun as saying the UK should be punished for leaving. Michael Heseltine’s point about loss of sovereignty is right. The idea that the EU is a threat to sovereignty is a fantasy. Outside the EU we would still have to comply with EU regulations in order to sell into Europe, but lose the ability to influence those. We cease being able to elect MEPs to represent us in the EU processes. We can negotiate trade deals, but with the reduced clout of a nation of 64 million rather than an EU of 510 million. Brexit is a flight from reality. It’s supported by those who don’t understand the EU. It’s supported by people who feel excluded and left behind — who it will leave even further behind. It’s a damning indictment of the poor quality of the British government, and, in particular, the blinkered stridency of the Tory right wingers who were muzzled in coalition. The parallels with the rise of Nazisim are real. This is not just about the “leap to the right”: as we are seeing now, facism needs reality to be denied and the press and the judiciary to be bent to the will of the fascist leaders. Those who voted with the Nazis we not evil, but they unleash something that was. It is too easy to say that is firmly in the past. The U.K. is now facing a crisis. What we need is good and wise leadership. What we have is Theresa May palling up to Donald Trump. In the very short term, we need the wise people who support remaining in the EU. We need people to vote LibDem, to begin to mobilise opposition. We need to be strident. The media is too willing to play along within those who project their own authoritarian and fascist fantasies onto the EU. The BBC are too afraid of being accused of bias. We need people who believe in an open, tolerant and united Britain to be public in pushing for it before the economic damage of Brexit pushes us into an even more dangerous place politically. A wise arrangement, leading to some sort of association agreement. This would not be the same as the arrangement Norway has, but the parallel is that Norway lost two referenda on EU membership and end up with an arrangement that delivers most of the benefits of EU membership, though at the cost of involvement in decision making. An outbreak of common sense, where the UK, having stared into the abyss of Brexit realises it is better off in the EU and people actually take the time to find out how the EU works. This would mean we stop talking of “unelected” commissioners and understand how they are appointed, and start taking elections to the European Parliament seriously rather than ignoring them and then dismissing the EU as “undemocratic”. 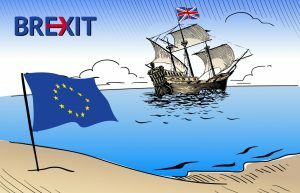 The nightmare scenario, where intemperate comments from pro-Brexit politicians, echoed by media afraid to challenge them, so alienates our partners and poison the public discourse that we are left adrift, without an association agreement, petitioning to join the World Trade Organisation. Theresa May’s administration was already close to steering us in the last of these directions when then Article 50 letter was drafted: its threatening language on security steers worryingly in the most destructive direction. Michael Howard’s ill-judged remarks about possibly invading Gibraltar beggar belief and have not helped Britain’s credibility. For now, the thing that seems most likely to tip us from the nightmare scenario to an outbreak of common sense is the pro-EU Tories making a stand. May it be soon and decisive. We are now faced with a situation where there is insufficient money for Schools, Housing, Child Care, the NHS, Social Care, Care Homes for the Elderly, Welfare, Local Authorities, and Transport. The first responsibility of any Prime Minister is to be First Lord of the Treasury. By treating an advisory referendum as mandatory and invoking Article 50, the government is starving essential services of the funding required. The devaluation of Sterling has not helped. Now too much parliamentary and Civil Service time and resources will be given over to Brexit. The cost of Brexit is starving so many essential services of the money that they need. The bill for leaving the EU also has to be settled. It is the economics of the madhouse. When the likelihood of cyber infiltration into the referendum is also considered, it really is time to stop and think hard.